The Reformatory School Ship Cornwall was the third such establishment to be founded, following in the wake of the two Merseyside vessels, the Akbar and the Clarence. A London businessman, George Chambers, who had been impressed by the Akbar proposed that London would benefit from similar institution. 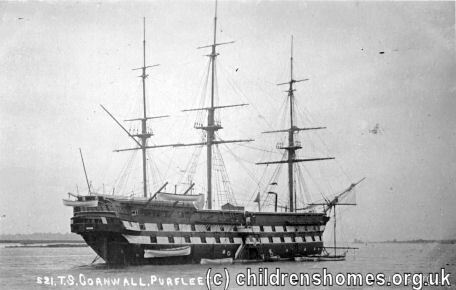 The Admiralty offered to donate an old frigate, the Cornwall, for the purpose as long as money could raised to fit her out. The necessary £2,000 was soon raised by public donations. The Cornwall was moored on the River Thames off Purfleet in Essex. She was certified for operation on May 2, 1859, with the first boy being admitted the following month. The ship could accommodate up to 250 boys, aged 11 to 14, who had been committed to detention for at least three years. A payment of 2s. 6d. per week was required for each boy's outfit etc. In 1868, the ship's committee discovered that the Wellesley, a receiving ship for the Royal Navy, based on the River Tyne, was about to be scrapped. They successfully petitioned the Admiralty to take over the vessel and in June 1868, the Cornwall and Wellesley switched places, and names. The 'new' Wellesley then moved up to Tyneside to become the Industrial School Ship Wellesley. The Cornwall, c.1910. © Peter Higginbotham. As well as learning nautical skills, boys on the Cornwall learned tailoring, and carpentry was later introduced. The ship later became noted for a proficiency in drawing. Boys could also develop musical skills in the ship's military band. In the early 1900s, the Cornwall was involved in several scandals. In 1902, the ship's second officer, Henry Hunt, was stabbed by two boys named Percival and Rixon. In court, it eventually transpired that the two boys, together with three accomplices who had sharpened the knives, had stolen tins of corned beef from ship's stores room a few days before, and feared that they were about to be identified as the culprits by the ship's officers. The boys pleaded guilty to the charges and, begging for a second chance, were allowed to return to the ship. Inmates of the Cornwall, c.1910. © Peter Higginbotham. A second knife attack took place in 1903 when Mr Maine, a Seaman Instructor, was stabbed by two boys named Bennett and Flack. These two and four others received eighteen strokes with the birch. Maine, perhaps fearing reprisals, decided not to prosecute the boys. However, several of those involved were transferred to the Philanthropic Society's Reformatory at Redhill. The Cornwall received further bad publicity when seven boys contracted typhoid. It was discovered that cheap blankets from army hospitals in South Africa, unwashed and infected, had been sold to the ship. These had been distributed to the boys, again without being cleaned. On April 1st, 1908 the ship was certified to accommodate 275 boys. In 1926, it relocated a few miles down the Thames to a new mooring at Denton, near Gravesend, with her capacity now set at 200 places. while on duty at the riverside at 11-55 a.m. he saw the Cornwall's cutter coming down the river. It kept the shore, and then made a tack for the centre the river, and passed in front of a tug which was proceeding up stream. When mid-stream it collided with another tug, which was also proceeding up stream. As near as possible the tug struck the boat on her port bows. It brought her round broadside on the starboard of the tug. Her sails then leapt over the bows of the tug, and in that position she drifted about sixty or eighty yards with the tug. The sails then ripped and she went down. 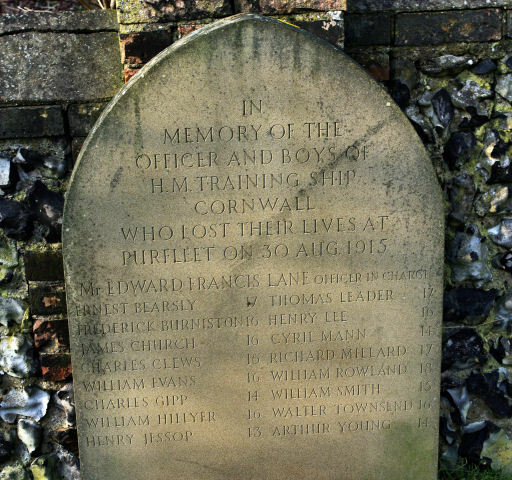 He heard boys crying for help, and at once went the wharf and obtained a boat, and with two other constables went out it, but failed recover any the bodies. The inquest was also told that despite having claimed to be able to swim, some of the boys involved had not passed the 40-yard swimming test required before they were officially allowed in such boats. After hearing conflicting evidence from those involved and other witnesses, the jury concluded the deaths had been accidental due to an error of judgment by the master of the tug. According to one estimate, the funeral of the victims was attended by four thousand people, with the ship's band leading the mile-long procession. 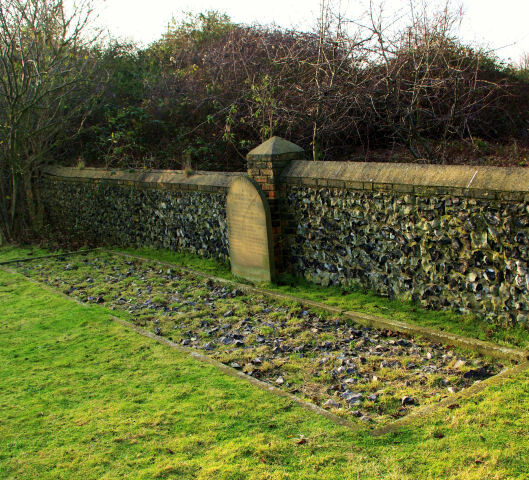 The boys were buried in a communal plot in the churchyard at St Clement's Church, West Thurrock. Peter Horne has kindly provided pictures of the location. TS Cornwall burial plot, West Thurrock. © Peter Horne. 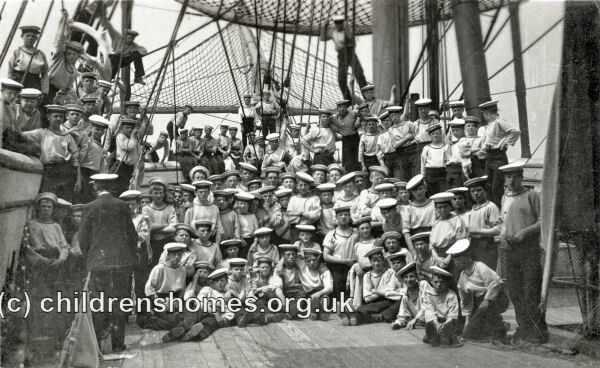 In around 1934, the ship became designated as an Approved School, one of the new institutions established by the 1933 Children and Young Persons Act. In July 1939, growing concerns about the various aspects of establishment's operation, coupled with deteriorating condition of the ship, led to a decision that the Cornwall would be closed in 1941. A few weeks later, with the outbreak of the Second World War, the boys were evacuated to a Ministry of Labour Camp at Brandon in Suffolk. A breakdown of discipline at the camp was followed by the withdrawal of its certification and closure. In September 1940, the ship, still moored at Denton, was hit by a German bomb and was effectively written-off.